Rick’s Heating & Cooling offers installation and replacement services on Armstrong Air oil furnaces, including the upflow oil furnace for homeowners throughout Morrow, Cincinnati, and the surrounding Ohio area. If you need a new furnace installed, consider the upflow oil furnace from Armstrong Air. At Rick’s Heating & Cooling, we’ve been doing business in the Cincinnati area since 1986, providing expert furnace installation services in Warren, Butler, Hamilton, Clermont, and Clinton counties. Our certified and licensed technicians can replace and install a new Armstrong Air furnace, service and repair your existing 80 advantage model (including emergency service 24/7), and even complete an annual maintenance inspection and tune-up on your system. If you’re looking for reliable and professional furnace installation service of a upflow model, call Rick’s Heating & Cooling today at 513-899-6005—or keep reading to learn more about the benefits of choosing this oil furnace. Armstrong Air 80 AFUE oil furnaces are designed to accommodate your comfort needs. For example, the transformer package and cooling fan is factory wired to make adding an air conditioner simple and easy.† Each furnace also features a factory-supplied air filter assembly to give you the option of adding a system to improve your indoor air quality. Advantage 80 oil furnaces are constructed with dependable features for long product life—like our ceramic combustion chamber and stainless cleanouts for easy access cleaning. In addition to high quality components, the Armstrong Air Advantage 80 oil furnaces are backed by some of the best warranties in the industry, including a Limited Lifetime HX Warranty on the heavy-duty heat exchanger and a Limited Five-Year Warranty on parts. One of the chief complaints about older oil furnaces is the amount of noise they make. But with the Armstrong Advantage 80 oil furnace, noise is no longer a problem! We start by giving our oil furnaces a fully foil faced insulated cabinet and an acoustically insulated burner enclosure. We also include a combustion chamber and a dynamically balanced blower assembly with robust bellyband mounting. Each feature does its part to keep operating noise level to a bare minimum. Efficient performance is key for ensuring comfort, which is why the Armstrong Advantage 80 furnaces come equipped with a Beckett burner for reliable combustion and a solid state ignition for hotter spark. In an effort to reduce energy consumption, without sacrificing performance, the Upflow oil furnaces are also equipped with a PSC burner motor for reduced power consumption. 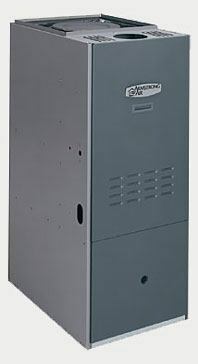 To have an Armstrong Air upflow oil furnace installed in your home in Lebanon, Morrow, Cincinnati or the surrounding Ohio areas, contact Rick’s Heating & Cooling. Our expert team of HVAC technicians has been proving exceptional furnace services to the homeowners of our area since 1986. We can help you properly size and fit not only your new furnace, but the ductwork as well—call us today at 513-899-6005 for a free estimate on qualified installations!